My Own Experience with Salt in my Diet. I continue to use 1-2 teaspoons of plain table salt in carbonated, chilled water every day and if I don't accidentally drop below 1 teaspoon I have no recurrence of cramps. The bar staff at my golf course have a container of salt behind the bar and they all know to make my drink a plain 'sodium and soda' with a touch of ice. 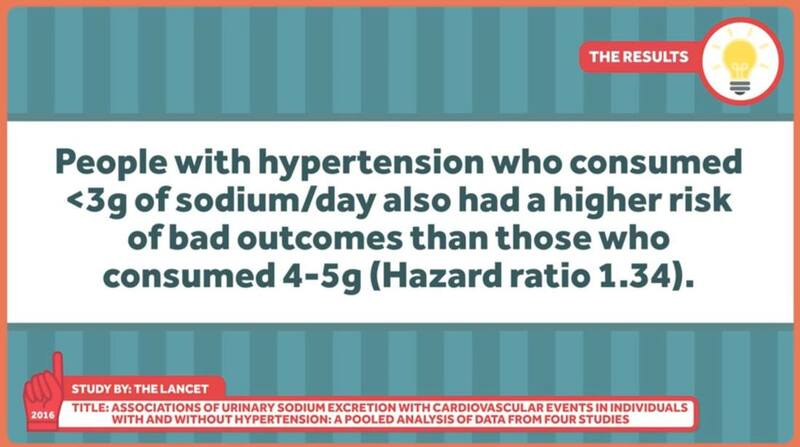 "The committee found no evidence for benefit and some evidence suggesting risk of adverse health outcomes associated with sodium intake levels in ranges approximately 1,500 to 2,300 mg/day among those with diabetes, kidney disease, or CVD. Further, the evidence on both the benefit and harm is not strong enough to indicate that these subgroups should be treated differently than the general U.S. population." "The average American takes in 3,400 mg of salt a day, about 1½ teaspoons. The federal guidelines say that it should be brought down to less than 2,300 mg a day. It’s a good thing that people have not been following their doctors’ advice, because it would have been killing them." ​In this study in which sodium intake was estimated on the basis of measured urinary excretion, an estimated sodium intake between 3 g per day and 6 g per day was associated with a lower risk of death and cardiovascular events than was either a higher or lower estimated level of intake. As compared with an estimated potassium excretion that was less than 1.50 g per day, higher potassium excretion was associated with a lower risk of death and cardiovascular events. Pink Himalayan sea salt is advertised to contain “the 84 trace minerals valuable to the body.” Naïve customers assume that more is better, and that we need more trace nutrients, so those 84 minerals ought to make pink Himalayan salt healthier than regular salt. That assumption is completely misguided. "Therefore, there is consistent evidence from clinical trials and observational studies to support reducing sodium intake to less than 5 g/day in populations, but inconsistent evidence for further reductions below a moderate intake range (3-5 g/day)." Salt is an absolutely necessary element of the human diet – humans die without adequate salt intake. For most people, consuming a moderate amount of salt daily (2,500-5000 mgs) has no adverse effects. High blood pressure (BP) is associated with cardiovascular disease and risk of premature death. For almost everyone, eating more salt causes an increase in BP, but the increase is not clinically important, averaging around 2.1/1.1 mmHg. For a certain percentage of people, believed to be in the 10-15% range, who can be labeled “salt sensitive”, dietary salt causes higher BP and for those already suffering high BP and who have a high salt intake, dietary salt reduction combined with improved diet (the DASH diet – more fruits, vegetables, and low-fat dairy, specifically) can help reduce BP to healthier levels. For most people, a diet too low in salt increases risk of cardiovascular events and increase risk of all-cause death. The science to quantify what constitutes “too low”, “moderate”, and “too high” regarding salt intake is best characterized as “somewhat uncertain”. The Salt Wars have been raging for 30 years, at least. One side of the Salt Wars believes that because dietary salt increases BP (in most people just by a small amount) and causes a big increase BP in some people, coupled to the idea that high BP is associated with increased heart disease and risk of death, that governments should take action to reduce the salt intake of everyone – population wide – through regulation of the food industry, setting dietary guidelines, etc. Arrayed on this side we find the American Heart Association, United Nations’ World Health Organization, and the US FDA. Many food and diet advocacy groups stand with the AHA against salt. Taken together, these groups represent a view that consists of a “bureaucratically entrenched hypothesis advocating an enforced solution”. The opposition believes that the science is not adequate to mandate a population-wide reduction of salt intake, maintaining that, in addition to being not necessary, it will cause harm instead of good, increasing cardiovascular events and premature death among all groups. The majority of scientists on this side of the issue also hold that the DASH diet is far more effective in reducing high BP than salt reduction. Despite the mounting evidence of harm from population-wide enforced salt reduction, various government agencies have been passing rules, regulations, and guidelines to force the food processing industry and, most recently, in New York City, mandatory labeling of highly salted foods by chain restaurants. The Salt Wars are an exemplar of what can happen when a hypothesis is scientifically correct but its real-world overall effect becomes grossly exaggerated. This can lead to a “mandated solution” which is then sold as a cure-all for some existing problem. As the underlying science is in fact uncertain, scientists in support of this view must turn themselves into advocates to make their case. Political advocates in turn pretend to be scientists, advising governments to enforce a “one-size-fits-all” solution on the whole society – even though it is probable that the claims of benefit range from uncertain, at best, to nonsensical [see footnote 2 for the my rationalization for this statement in the Salt Wars]. Captain James Cook saw Polynesians in Hawaii manufacturing salt in the late 1700s, but it was never produced by Māori in New Zealand. Nevertheless, Māori had a conception of saltiness in their word mātaitai, meaning tasting of salt, or brackish. Their sodium needs were met through a diet of fish and shellfish. When salt was introduced by Europeans, some Māori believed that eating salted foods caused their people to contract illnesses previously unknown to them. However, the real reason was that Māori had no natural immunity to the infectious diseases introduced by Europeans. Does iodine added to salt lose effectiveness over time? Yes it can, but this depends on where the salt comes from and how much moisture can get to it as well as how refined it is. Here is the study. A high-salt diet has been found to lower blood levels of uric acid, a recognised trigger of gout, according to a study by US researchers.